A proposed model for polymorphism in Acherontia atropos | Welcome, visitor! The larvae of the deathshead hawkmoth (Acherontia atropos) are highly polymorphic; and they seem to exihibit three “basic” forms – yellow, green and brown. This can be observed in larvae of Acherontia styx and Acherontia lachesis aswell. To me, it seems that the brown form of Acherontia atropos is only observed in the final instar (correct me if I’m wrong). But often have I seen yellow L4 larvae shed skin and turn into a brown L5, but I have never seen an image of a brown larva in L2/L3/L4. However it also seems to be that the GREEN form of A. atropos (that I have never seen in captivity) can be observed in all life stages; atleast I’ve seen images of larvae in younger instars that appear to have the green instead of yellow colouration. 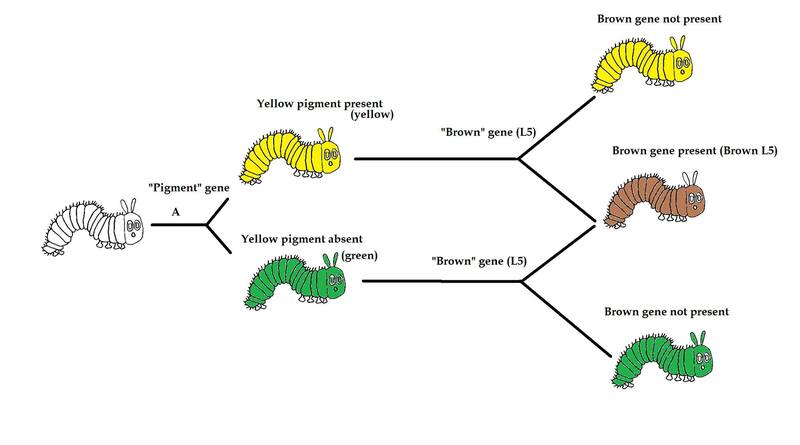 What I am wondering if perhaps “green” and “yellow” are genetically variations of the same form, that are not mutually exclusive with the “brown” form, since perhaps the genes for the brown L5 stage have a different origin than the ones that decide the yellow or green form. Genetic variation in pigmentation can easily turn yellow insects green or green insects yellow (as seen in some forms or mutations of stick insects for example), while the morphology of the brown form also seems to be very different from green or yellow – it seems to be more than just a recolor. This could also explain the intermediate forms of the larvae that very rarely appear; they are the type of larvae that appear to be a mix of green and brown or yellow and brown. If the brown larval phenotype is somehow not fully expressed through their entire body, the base colour still seems to be the yellow or green form, overlaid by brown pigment. Has anyone ever seen a green larva develop into a brown L5? That would mean that form A (yellow/green) and form B (brown) are not mutually exclusive, while yellow and green are mutually exclusive because they are variations of the same genes that do not code for brown forms. What do you think?